3/8" NPT threaded brass body and a 2 pin terminal. Use for measuring air inlet temperature. Exposed sensing element, necessary for boosted engines where fast response times are necessary. Due to the fragility of the sensing bulb, it is necessary to pot the base of the sensor leads with sensor-safe silicone when used in high vibration environments. These sensors are appropriate for measuring fluid pressures in an engine. Not appropriate for measuring manifold boost or vacuum as these are relative pressure sensors. Use an absolute pressure sensor instead. 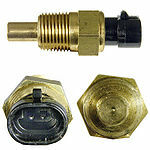 150 PSI pressure sensor, appropriate for oil and fuel. 150 PSI stainless steel pressure sensor. Other sensor ranges are possible - e.g. 10, 30, 150 bar, with a consistent linear output. 2175 PSI / 150 Bar stainless steel pressure sensor. An extremely popular MAP sensor used in the Megajolt ignition and Megasquirt fuel injection systems. Schrader TPMS receiver outputs tire pressure data on the CAN bus. would need to reverse engineer CAN bus protocol. Autosport Labs CoilX The CoilX sensor module is designed to safely interface the noisy, high voltage RPM signal at the ignition coil pack primary into a clean signal that RaceCapture/Pro can process. 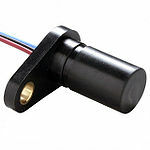 Hall effect speed sensors will require an external 1K pull-up resistor, connected to 5v. This can be wired up near the sensor connection for convenience. 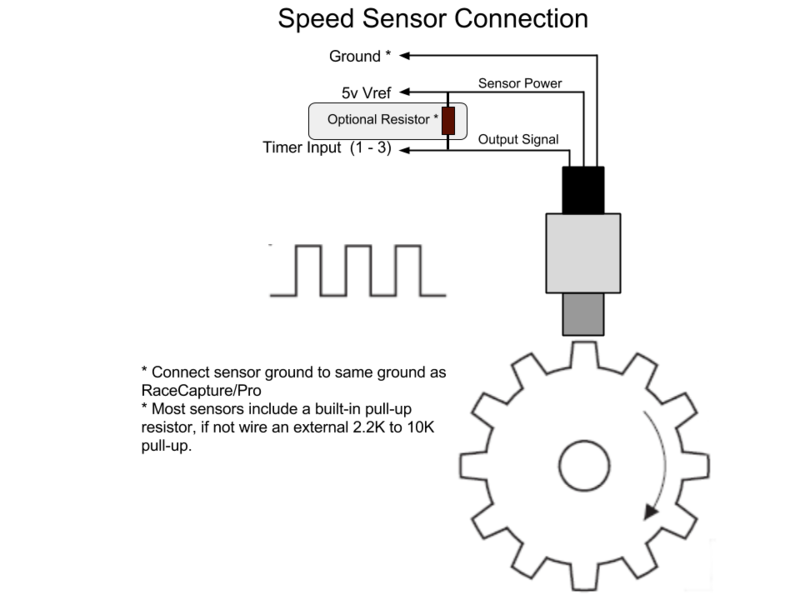 Configure the pulse channel with the number of pulses per revolution, which maps to the number of teeth on the gear / wheel. After installation place the vehicle on a level surface. At rest, note the voltage of the sensor. This is the zero level. Raise and safely support the corner of the vehicle and remove the spring. Repeat the compression voltage / distance values for the 4th and 5th columns. Measures distance over 90 degrees of the arm travel. To calibrate, note the voltage at 0% throttle and then at 100% throttle. Use these two numbers to create a 2 point analog scaling map. RaceCapture/Pro has 8 analog inputs; the 8th input is wired internally to measuring battery voltage. Refer to your sensor's data sheet for the sensor's calibration curve. 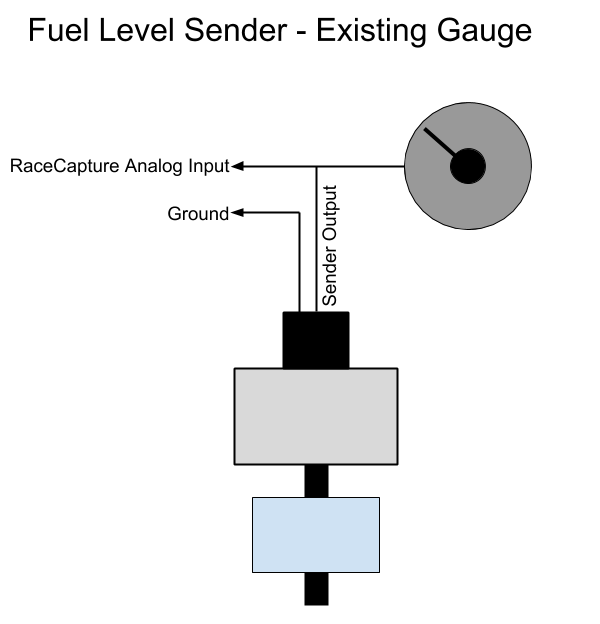 A linear sensor may specify two voltages/value pairs representing a low and high range for the sensor. 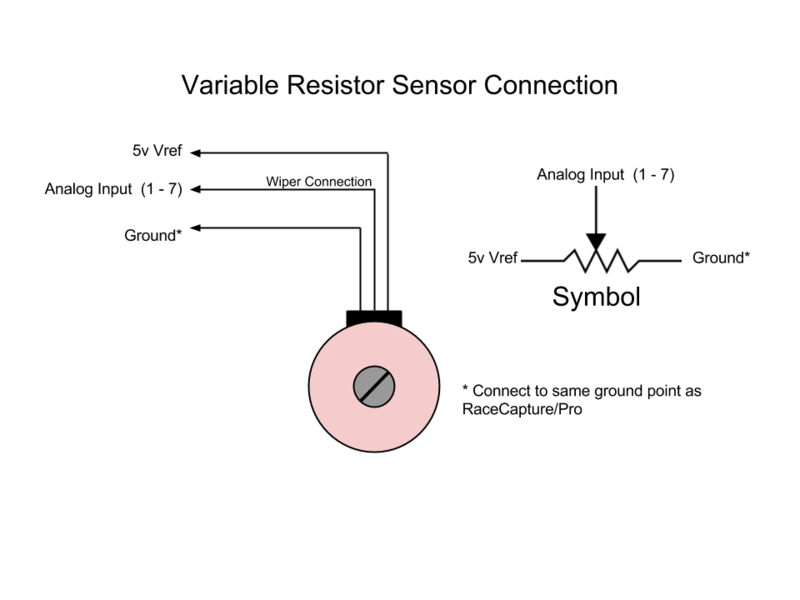 A straight line is drawn between the points on the sensor. In the Analog Channel configuration, select the "'Mapped"' sensor mode, and then enter the values into the interpolated mapping grid. For column 1, enter the low voltage range in the Volts cell, and the low scaled value in the Scaled cell. These are often seen with thermistor based temperature sensors, where the response is not a straight line, but a curve. Multiple points can be used to sufficiently approximate the curve. Note: RaceCapture will linearly interpolate the scaled values between the sensor points, so value transitions will be smooth. In the Analog Channel configuration, select the Mapped sensor mode, and then enter the values into the interpolated mapping grid. Note: If you have more than 5 points for the curve, spread the selection of points evenly between your low and high range. Temperature sensors are passive devices that measure temperature through the use of a thermistor, a resistor that varies resistance with temperature. 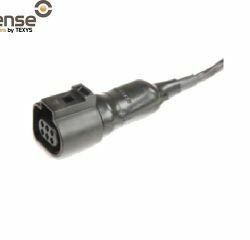 We recommend using dedicated, two wire ECU-style sensor similar to the types specified in our recommended sensor list for best results. 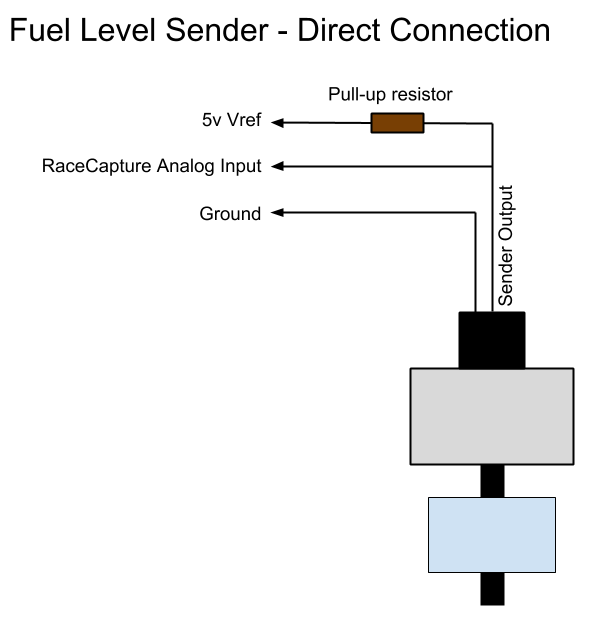 A pullup resistor is needed to create the necessary voltage divider circuit so RaceCapture/Pro's analog input can measure temperature as a varying voltage. This pullup resistor is connected to the 5v reference on the RaceCapture/Pro terminal block. Low resistance gauge type sensors are not recommended. If you must use one of these types of sensors, a 1/4 watt 220 ohm pull-up resistor can be used for sensors such as VDO 323-095, 325-002 and similar. Two wire ECU style temperature sensors have one sense lead and one ground lead. For best accuracy, connect the ground lead to the same ground point as RaceCapture/Pro. One wire gauge type sensors have the ground as the body of the sensor. Ensure the engine is properly grounded to the chassis via multiple ground straps. Active sensors are powered devices that provide a variable voltage output related to the environment being measured- such as pressure, distance, temperature, speed, force, etc. Active sensors are particularly easy to wire. Nearly all active sensors for automotive applications specify 5v power and produce an output within 0 to 5v, making them directly compatible with RaceCapture/Pro. Most active sensors have a linear output and therefore are very easy to calibrate. Identify the power, ground and output signal wires. The sensor technical documentation will provide this information. Note: - We do not recommend using 2 wire Variable Reluctance (VR) type sensors. VR Sensors will require a conditioning circuit before being provided to the inputs of RaceCapture/Pro. RaceCapture/Pro requires both a voltage and ground pulse provided in the waveform provided by the sensor. Most sensors provide an internal pull-up resistor so an active square wave can be observed on the output. However, some sensors only switch ground and leave the output line in a high impedance state when not active, like opening and closing a mechanical switch. If the sensor does not provide a pull-up resistor the wheel speed signal may have noise and glitches which may be observed as high value glitches in the dashboard and log file data. These are typically found in Throttle Position Sensors (TPS), string potentiometers, and linear sensors. 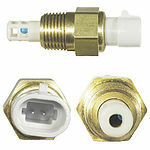 Consult the sensor's technical documentation for sensor connections. During calibration, if the sensor reads backwards, flip the 5v and ground connections. Also a variable resistor, these provide a variable resistance based on the level of the float. Determine if you need a pullup resistor, or if you are tapping into an existing circuit with a gauge. You will not need a pullup resistor - the gauge's internal circuitry already provides one. You will only need to tap into the existing signal feeding the fuel gauge sender. Jump to the calibration process below. Note you will need to ensure the sender does not exceed 5v during calibration. if it does, you will need an additional voltage divider to scale the voltage down to 0-5v required by the RaceCapture input. If you only have the sender and want to directly integrate with RaceCapture's analog input, follow this procedure. Choose a pull-up resistor value based on the the sender's ohm range. If it is less than 1000 ohms, then choose a 1000 (1K) ohm resistor as your pull-up. If the sender range is higher than 1000 ohms, choose a 2.2K resistor. Rule of thumb - choose a resistor that is about 2X to 4X the maximum resistance of the sender. A 1/2 watt, 1% accuracy resistor is recommended. 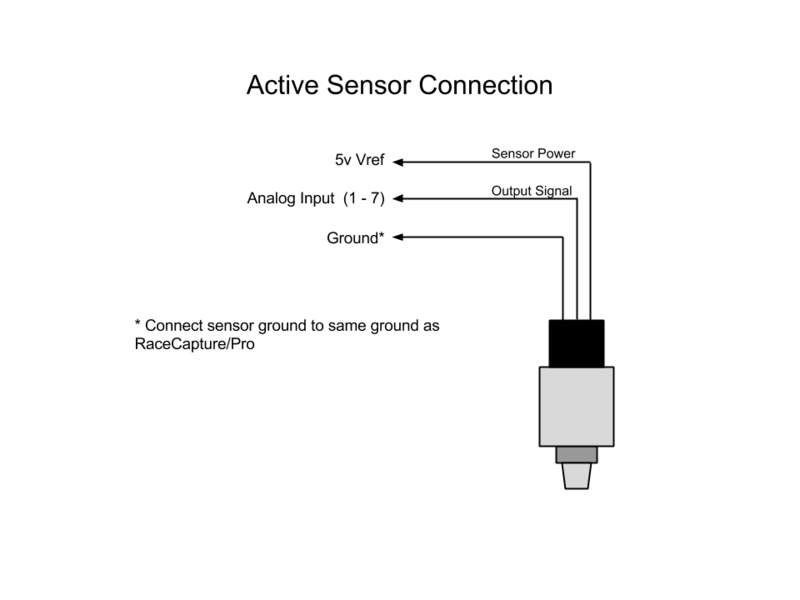 Connect the pullup resistor between +5v reference and the sender's output. This creates the voltage divider circuit which will present RaceCapture with a variable voltage depending on fuel level. Choose an available analog input for your Fuel Level channel, then select the basic fuel level preset by selecting FuelLevel in the dropdown list. This pre-sets the units (%), logging precision and min / max values. You can edit this by pressing the gear button next to the channel name. Set the sample rate to 1Hz. Set the mode to Mapped. This will let you create a curved mapping for the sensor voltage. Set the smoothing to Maximum - this will help account for variances due to fuel slosh. Enter the mapped values noted in the calibration process into the Analog Channel mapping editor under RaceCapture setup. This will provide the calibration curve for your fuel tank. Write these settings back to RaceCapture and observe your fuel level readings in units of percentage. SensorX is a breakout / distribution board that will make it easier to use sensors that require pullup resistors as well as making available multiple ground and 5V Vref connections. The built-in pullup resistors are easily disabled by breaking a designated trace on the board. This board is compact; enough to be bundled inline with your wiring harness and covered in heat shrink tubing when complete.